Dumb, fun and full of guns – it’s Deadpool! So Deadpool now has a load of cash after the clash with Hawkeye / Bullseye, and after blowing his head off in boredom he now wants to be a pirate. He goes to do a deal with some Russians (from whom he has already purchased a ship that sinks – and that is typical of the humour here) and enlists ‘Bob’ to join him – as his parrot. The plan? To rob a private island getaway of its yachts! I love this series. It’s stoopid (sic). Teh (sic) stoopidist (sic again) comic around. Daniel Way writes this stuff as fun for kids of an advanced age, but with their humour in the toilet bowl. Shawn Crystal has a good eye for a funny visual. You will laugh at the parrot. Oh, and that cover is cool. 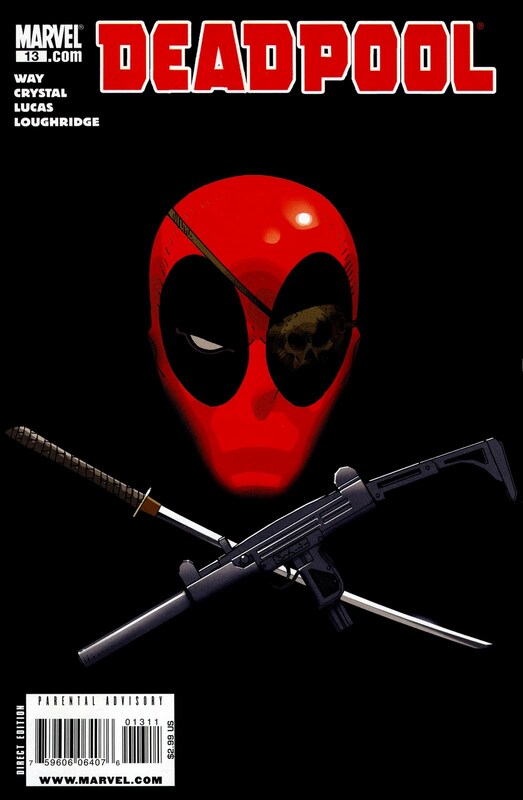 Rob Liefeld did such a great job – nay, iconic job – on the design of Deadpools mask that you can stick it on a cover with pretty much anything – a Jaws parody, or in this case a variation on the skull & crossbones – and it looks thrillingly. In a week where Rob Liefeld is in the news for being on the wrong end of some fanboy entitlement issues (google for liefeld and yellow hat guy if you must) I am happy to mention his name in a more positive sense.